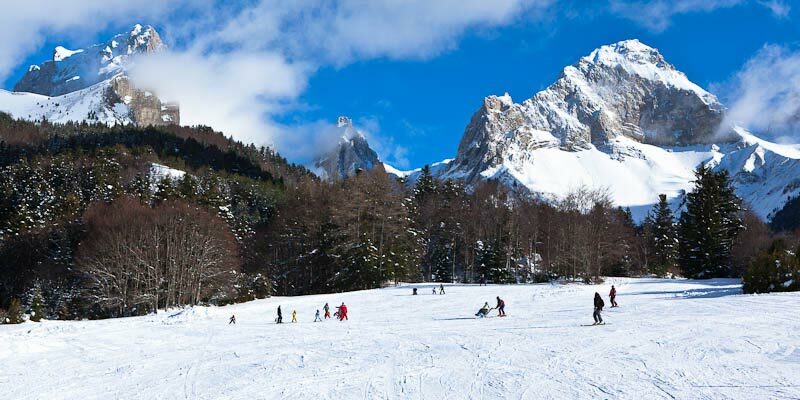 Snowy valleys and aerial summits, at the crossroads of Bochaine, Vercors and Dévoluy, Saint Julien is the ideal place for a family snowshoe hike, a day in a ski resort or a ski touring tour! Super Dévoluy ski resort : at 50 km, skiing big on the ridges of Dévoluy. Off the marked trails, you can practice ski touring or the cascade of ice … (information at the Tourist Office of Lus). Go up to the station Lus-la Jarjatte (10 km). At the bottom skiing center you can rent ski or snowshoes and discover the valley of La Jarjatte, under the snow … a small stop at La Bergerie for a hot chocolate at the bottom of the valley! Perhaps you will see a deer or a chamois! In any case, there will be many traces! Cross-country ski center: 04 92 58 54 96 – equipment rental – piste map – Free access to the cross-country ski trails. Depart Saint Julien, direction La Faurie and Montbrand via a beautiful little wild valley. Continue on the Col de la Haute Beaume to go down on La Beaume and climb the Col de Cabre. Enjoy the sundial at the exit of the tunnel. Before arriving at Luc en Diois, admire the Claps, chaos of rocks and small swimming lake. In Die, inevitable visit of the old town and the cellar Jaillance. We return to Châtillon en Diois, to discover the old town with its viols. One goes up towards the pass of Grimone via the gorges of the Gats, overhung by the Sucettes of Borne. From the Col de Grimone, one goes down to Lus la Croix Haute and its alpine landscapes. Finally, return to St julien en Beauchêne. A beautiful day, about 140 km. BOOK A ROOM RIGHT NOW !